Walt Disney World in the Summer was NEVER something we wanted to do. EVER. With degrees in the high 90’s and the heat index even higher, Florida has sporadic but not cooling afternoon downpours. With vacationers as far as the eye could see, we had pretty strong reasons for always choosing the off-season for our Disney Vacations. 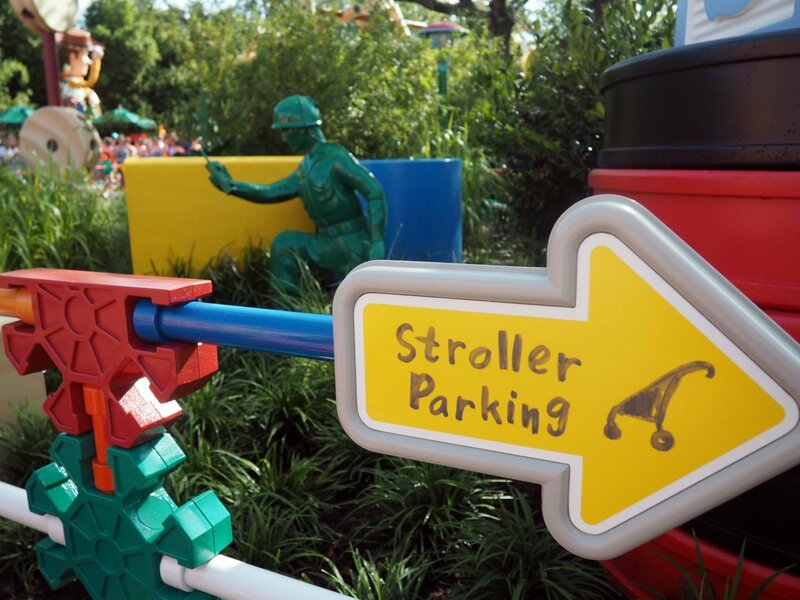 But then Toy Story Land was pushed back to a summer opening date, and we simply HAD TO GO. 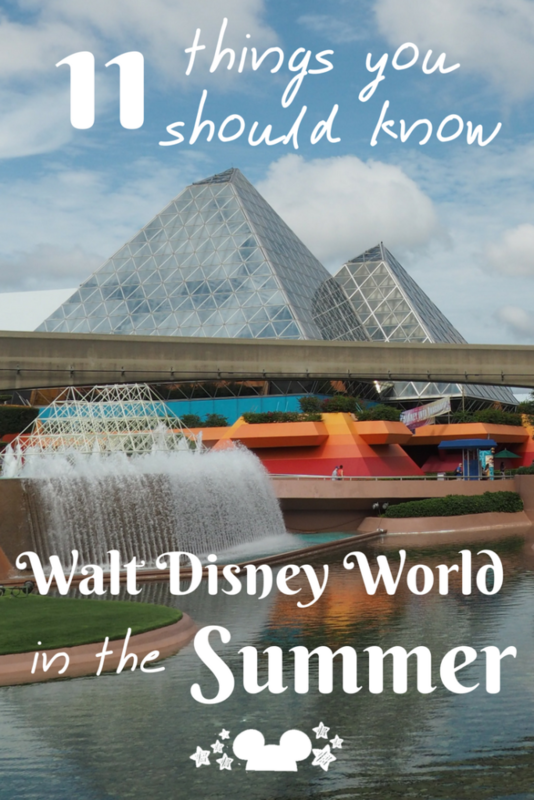 Spoiler: We were floored by how much different Walt Disney World is in the Summer! Like really crazy DIFFERENT. So here’s all the things to look out for when next you’re planning your vacation to Disney during the summer months in Florida. Ok, so let us just preface this by saying that we totally (totally) understand that people have to plan their vacations around school schedules, work vacation allowances, and the best travel deals. We get it. Totally. 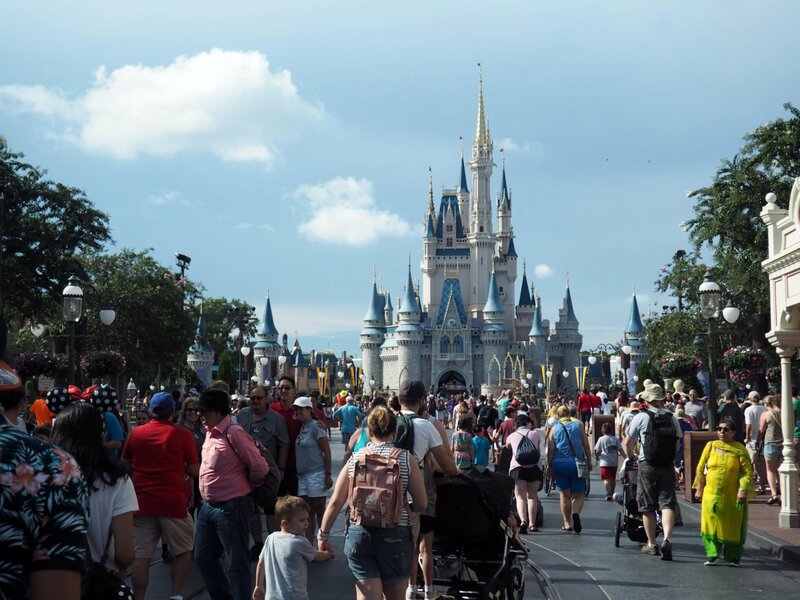 However, we’d like to take a minute to mention that what you get in return by letting the school schedule, work schedule, or deal determine that you visit Walt Disney World in the summer, will no doubt cause it to be less magical. Got that? Less Magical.Really, we’re just looking out for you here. If you have any flexibility at all, we highly recommend you visit Walt Disney World in the Winter, Spring, or Fall instead. Mind you, there are pros and cons to visiting Walt Disney World in the summer, but if we have to pick a season, its always going to be fall. We’ll let you make your own choices though. Here are 11 things to keep in mind if you decide to visit Walt Disney world during the summer. So, honestly, we don’t actually mind the heat in Florida. We do, however, hate the humidity. If you’ve heard people complain about Florida humidity you’ll understand it’s as if you’re walking around in a sauna all day. There’s some pretty constant sweating. Sometimes thankfully alleviated by air conditioned rides and dining reservations, but that’s it. And essentially our advice on Disney heat is don’t be outside between 12 -4 pm. Unless you’re in the pool. Now, are you really going to spend thousands of dollars on a Disney vacation to spend 4 hours a day at the resort pool? We wouldn’t. While we always recommend heading back to the resort and taking breaks. The summer makes that a necessity, as opposed to a stress management strategy. And don’t get us wrong, we love the rain. We rarely leave our resort without ponchos and know how to maximize Disney in the rain. But summer rain isn’t like the fall rain that lasts for 10 minutes and cools you off. It’s the kind of rain that just rains to annoy you. Or so it would seem. Check out our tips on dealing with the heat if you decide to venture to Walt Disney World in the summer. Much like when we talk about the stroller struggle (no offense moms we know you don’t love lugging those strollers around )the group struggle is just as real. While we assumed there’d be an increase in groups, we didn’t realize they would mostly all be extremely large groups. With college freshman as group leaders. What this scenario causes is lots and lots of people now in line for the rides. And an extra long wait for lunch and no where to sit. We actually had to stand with our trays of lunch at a certain restaurant, behind a rope until a table opened up. We had never seen this method of seating people for lunch happen before. If groups were bad at the restaurants, imagine the resort. 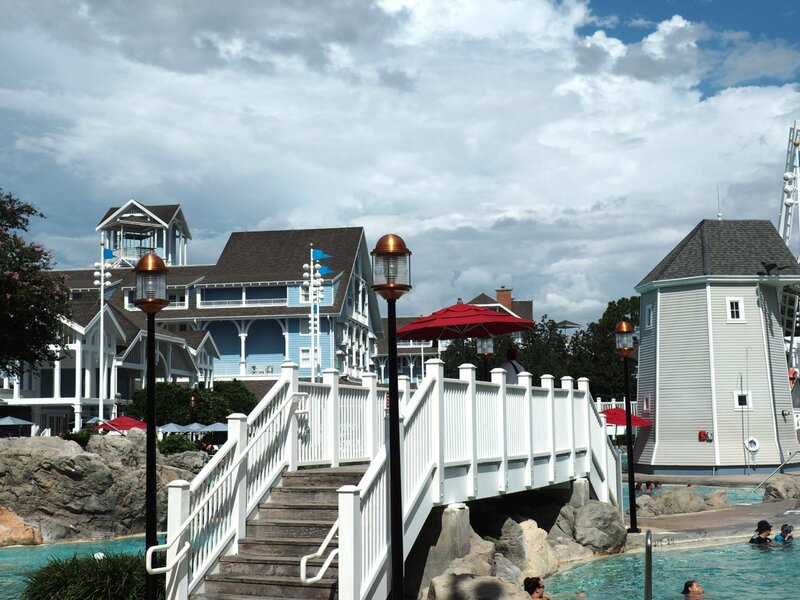 Thank goodness we were staying at The Boardwalk Inn Disney Deluxe Resort this last trip. Because our sanity probably wouldn’t have lasted at the All-Stars Resorts, where these groups were staying. We like families, heck, we are a family vacationing every time we go to Disney. And most families work around schedules. But primarily all show up at Walt Disney World in the summers to take advantage of the kids summer vacation. What makes this a little bit of an issue is that it’s usually their big vacation for the year. This means we hear more fights. There are more moms wondering why this isn’t the perfect vacation she planned. And more dads trying to pull multiple tables together in the dining hall to seat the family in one spot for lunch. Plus there are more strollers. With more family vacationers we also see many people who are first timers, which leads us to our next point. As a first time vacationer there are simply things you won’t know! And Summer is not the ideal time to learn new things at Walt Disney World. You will get frustrated. With crowds at Walt Disney World at their highest in the summers, it’s harder to fumble with the magic band reader. More difficult to manage the parade crowds and get a seat. And impossible to ask questions regarding the quick serve menu. And FYI, you can’t make special requests on quick service food. The hamburger will come with tomatoes and you’ll have to pick them off if you don’t want them. Things like this are easier learned when the crowds are lighter, the weather cooler and the overall stress of both guests and cast members lower. We’ll admit the lure of special summer photo ops call us every time. 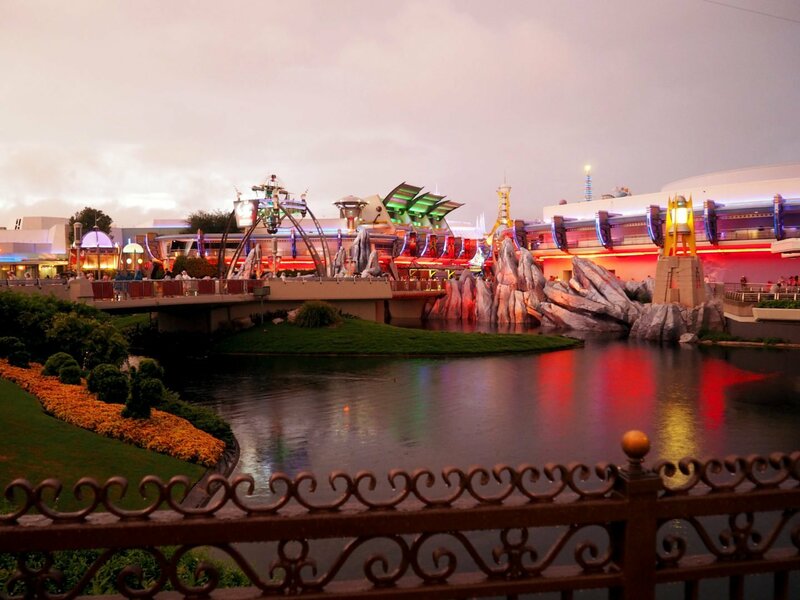 Summer is the only time you’ll get to see certain decorations or themed areas. 2018 hosted the Incredible Summer in honor of Incredibles 2. 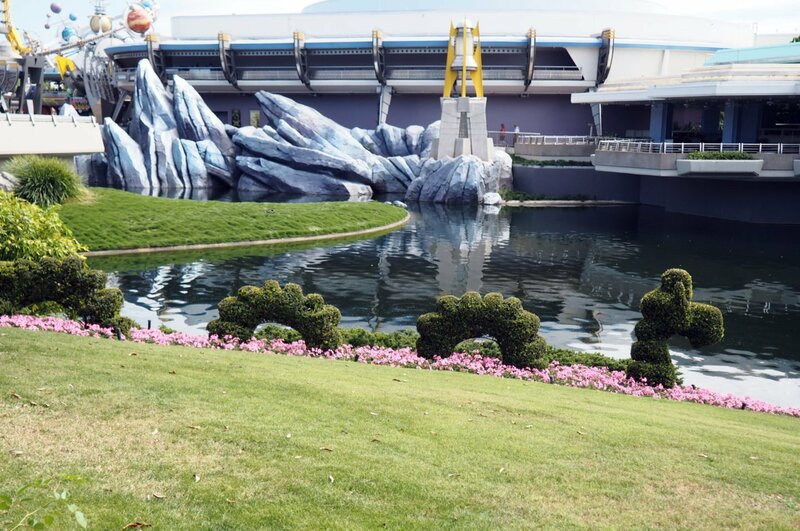 This included special treats, special drinks, and special photo backdrops set up around Tomorrowland. While this alone wouldn’t be enough to get us to deal with the heat, crowds or higher cost of vacationing on season, it’s a definite perk for those who do. We’ve waited years to finally frequent the Tomorrowland Terrace. Mainly because it’s a Magic Kingdom restaurant we always walk through but never actually tried. But because of the new Happily Ever After Fireworks Dessert Party, this summer-only restaurant now closes at 3pm. We’ve additionally tried to grab the Desert Pear drink from The Golden Oak outpost in Frontierland several times. Alas, they too are only open at select times and days through the summer. 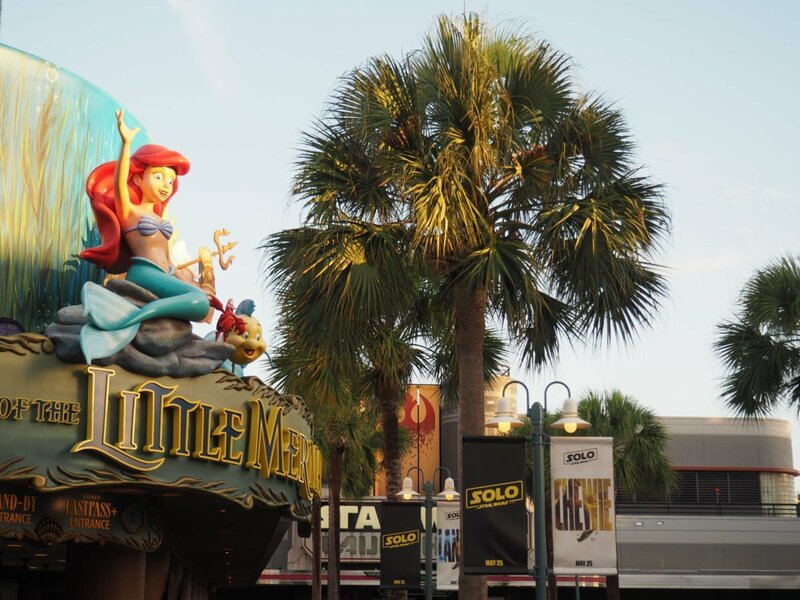 Visiting Walt Disney World in the summer means you can finally get access to these otherwise closed locations, but you do have to time it right if you’re hoping to take advantage. While the ride lines are always shorter during the parades and fireworks in the fall, winter and spring, we were absolutely floored by how short they get during the summer at show times. Our explanation is that since there are so many groups, families and first-time Disney vacationers, there is a larger amount of people who have never seen the parades or fireworks. This is in contrast to the people we see throughout the rest of the year who are either seasoned vacationers, pass holders, Florida residents or annual Disney vacationers. Peter Pans Flight, which is routinely a 60 minute wait or higher any time of year, got down to a 15 minute wait as soon as people started getting their seats for the evening shows. The Snow White Mine Ride fell to a 20 minute wait, Winnie the Pooh to a 10 minute wait, and Haunted Mansion to a 13 minute wait. We’ve been visiting Walt Disney World for 5 years, travelling off-season, and have never seen ride wait times this LOW! Ok, so you may not think that too much could possibly change regarding how one gets in line at a restaurant and orders food just because it’s a different season, but it does for several reasons. More international travelers offer a significant language barrier that slow down restaurant lines. First-time vacationers don’t realize they can’t modify their order or ask for substitutions at quick serve counters. The drinks and food all run out faster, so it requires cast members who could be at counters, to spend time refilling machines or filling drinks instead. The restaurants with counter service are only meant to hold so many people, and summer offers more people than can be accommodated. When restaurants with seating get too crowded, cast members are brought in to help locate tables and seat guests when tables become available. If travelling in the summer we highly recommend that you take advantage of mobile ordering. This is by far the easiest way to get your food in a timely manner and possibly even snag a table while you wait. For the sake of getting out of the heat, you will most likely choose rides and attractions that are indoors. 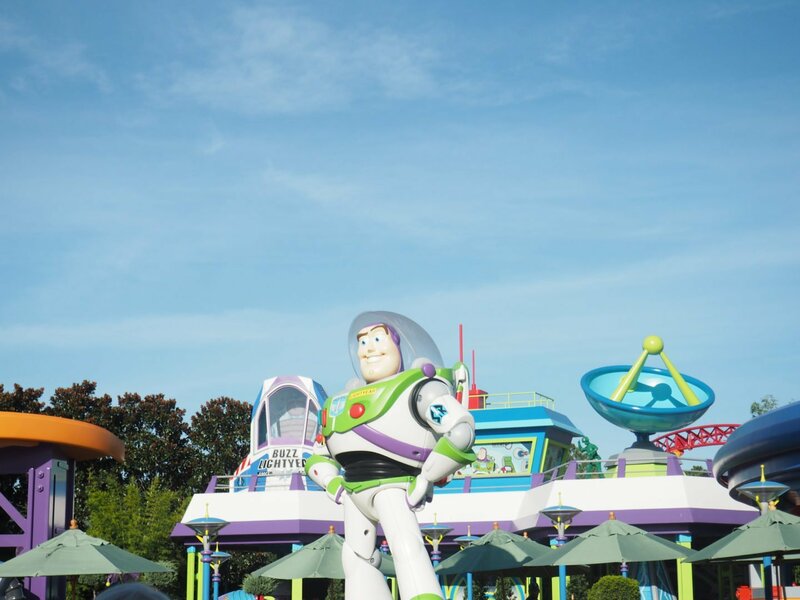 While we think this an excellent strategy to beat the heat at Walt Disney World, you will definitely want to try to tackle some of the outdoor rides while you are on vacation as well. So make sure you choose your favorite ride fast passes, regardless of the weather. 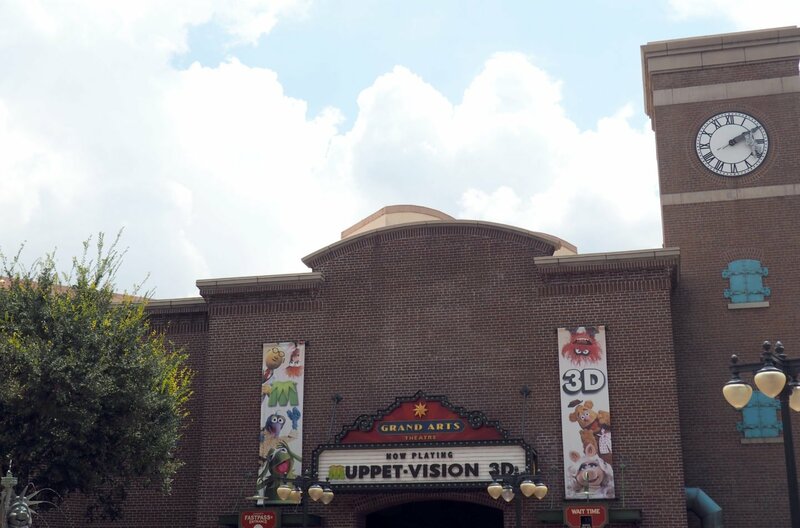 We love Philharmagic at Magic Kingdom, Muppet-Vision 3D in Hollywood Studios, Festival of the Lion King at Animal Kingdom and the Gran Fiesta Boat Ride at Epcot. Definitely make time to enjoy these attractions in the summer! The heat in Florida can cause heat stroke pretty quickly, so grab a venti ice water from Starbucks, or bring a water bottle and get familiar with the water fountains. Much like how vitamin C will prevent sunburn, Water will prevent headaches, crankiness and dehydration. In the summer you are constantly thinking about your water consumption and if you drank enough, or your sunscreen and if you need to reapply. For us the preoccupation with these things isn’t present, but minimally, any other time of year. We were shocked at how completely empty our resort was this summer. But then, we shouldn’t have been shocked, have you seen the moderate and deluxe resort prices during the summer? High prices no doubt keep most people away, but if you’re lucky you can find the best deals on hotels.com. If you decide to travel in the summer and are hoping to avoid the large travel groups, we recommend booking your resort early and trying for a moderate or deluxe if you can swing it. Now you may be reading this post and saying, “Wow, girls you are really Princess-y!” And see, that’s just the thing, we are Princess-y! That’s why we go to Disney. But preferably not in the middle of summer. We’ve had vacations that are sub-par and vacations that are amazing. We’re fortunate enough to be Walt Disney World Annual Passholders, which allows us to try things and visit Walt Disney World throughout the year. It’s because of this that we can say with quite a bit of confidence that, for us in our opinion, other times throughout the year are simply more magical because we are not preoccupied with the heat. Hopefully this inside look at what Summer at Walt Disney World holds will help you in your planning for your next vacation. If you’ve got a question, feel free to comment or email:) Here’s hoping that no matter when you travel you have the best vacation! we just returned from a mid July Disney vacay. We had never been during July, and we were worried. It was the only time we could go due to schedules. It ended up being a great trip! It was hot, but it was overcast a lot of the time due to the brief thunder showers. The lines weren’t too terrible. We did wait 1 hour and 10 minutes for the test track and about and hour for the new Avatar ride. I wasn’t prepared for the large travel groups, and we did stay at the all star resort. there was a very large group in front of us for the bus line. they were nice and let us go in front of them to board the bus. We have been around 8 times since 1994, during different times of the year. This trip was just enjoyable as the others.